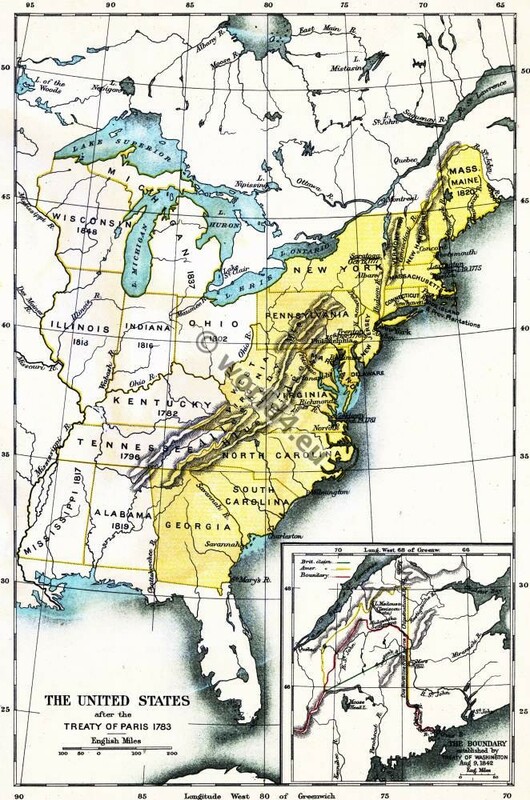 Home » The United States of America after the Treaty of 1783. THE signing of the Treaty of Paris, September 3, 1783, marked the formal appearance upon the world-stage of a new great Power. By the first Article, ‘His Britannic Majesty acknowledges the said United States, viz. New Hampshire, Massachusetts Bay, Rhode Island and Providence Plantations, Connecticut, New York, New Jersey, Pennsylvania, Delaware, Maryland, Virginia, North Carolina, South Carolina, and Georgia, to be free, sovereign, and independent States; that he treats with them as such . . and relinquishes all claim to the government, propriety, and territorial rights of the same and every part thereof.’ Vermont, which had originally been part of New Hampshire, but had been joined to New York in 1764, became a separate State in 1791; Maine was carved out of Massachusetts in 1820; and West Virginia out of Virginia in 1863. 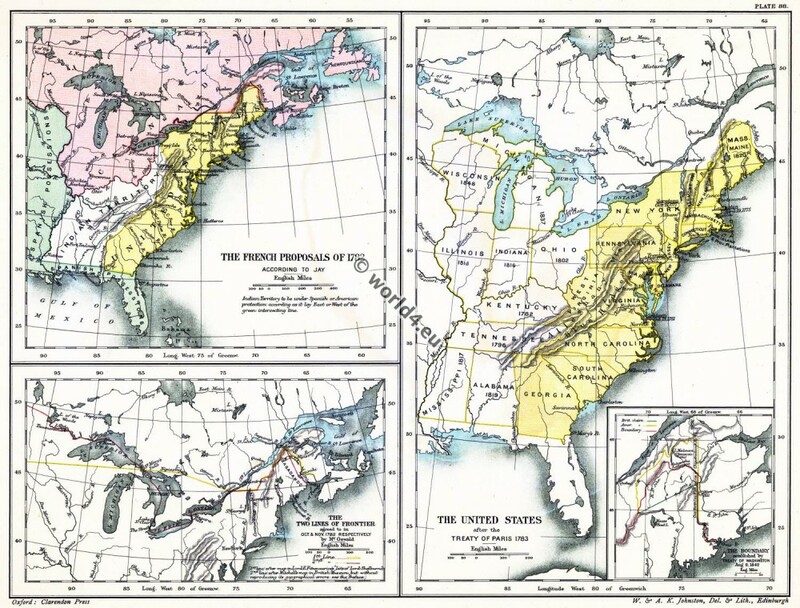 In defining the area of the United States, the Treaty, instead of leaving the task of finding exact boundaries to commissioners appointed for the purpose, endeavored, in the absence of geographical knowledge and correct maps, to achieve the impossible. On the east and west the Atlantic Ocean and the Mississippi afforded natural boundaries, though we may note that the Mississippi boundary was not obtained without a struggle. The British contention had been that not only should the United States not include any territory comprehended within the province of Quebec, but that the whole western country should remain British, including even lands within the areas of the colonial charters, where such lands had remained ungranted by the King of Great Britain. The recognition of the Mississippi as the western boundary was of far-reaching importance. The tendency to move into the fertile backlands, watered by the Ohio, was already beginning, and any attempt to check it must have led to renewed hostilities. The western lands were at first claimed by the individual States, on the ground of the terms of their charters, cession by Indians, or conquest, but finally the various claimants ceded their rights to the United States; and in 1787 the Ordinance was passed under which these lands, at first governed by Congress, became, with the growth of their population, first Territories, and finally States of the Union. Although this Ordinance applied only to the lands northwest of the Ohio, it was followed as a precedent in dealing with other districts. By this means nine new States were eventually carved out of the western lands ceded in 1783, viz. Kentucky (1792), Tennessee (1796), Ohio (1802) Indiana (1816), Mississippi (1817), Illinois (1818), Alabama (1819), Michigan (1837), and Wisconsin (1848). The constitutional method adopted by the United States served to disguise the fact that the result showed the most successful natural emigration known in history. The Lines of Frontier agreed to in Oct. & Nov. 1782 respectly by Mr. Oswald. 1st line after map in Lord E. Fitzmaurice`s Life of Lord Shelburne. 2nd line after Mitchel`s map in British Museum, but without reproducing its geographical errors. It was the belief that France was opposing American interests, with regard to the western country, which led Jay-who, with John Adams and Franklin, was American Commissioner-to desire to come to terms with Great Britain before the formal signing of peace between the latter and France. The aims of the French in 1782 are indicated in a map on the left hand of the accompanying Plate. According to Jay, France was opposed to the fisheries, under the Treaty of Utrecht, being thrown open to the Americans, while Spain was anxious to exclude them from the free navigation of the Mississippi. On the south the boundary question seemed tolerably clear. The southern boundary was the northern boundary of the Floridas according to the 1763 Proclamation. In as much, however, as ‘the Floridas’ were ceded to Spain by the 1783 treaty without any statement of boundary, and as the commissions of the English governors of West Florida had extended to 32 degrees 30 minutes, Spain maintained that she was not bound by the 31st degree boundary mentioned in the. treaty between Great Britain and the United States. The question was settled in 1795 in favor of the American claim. It was, however, on the north-east and north that the main difficulties arose. 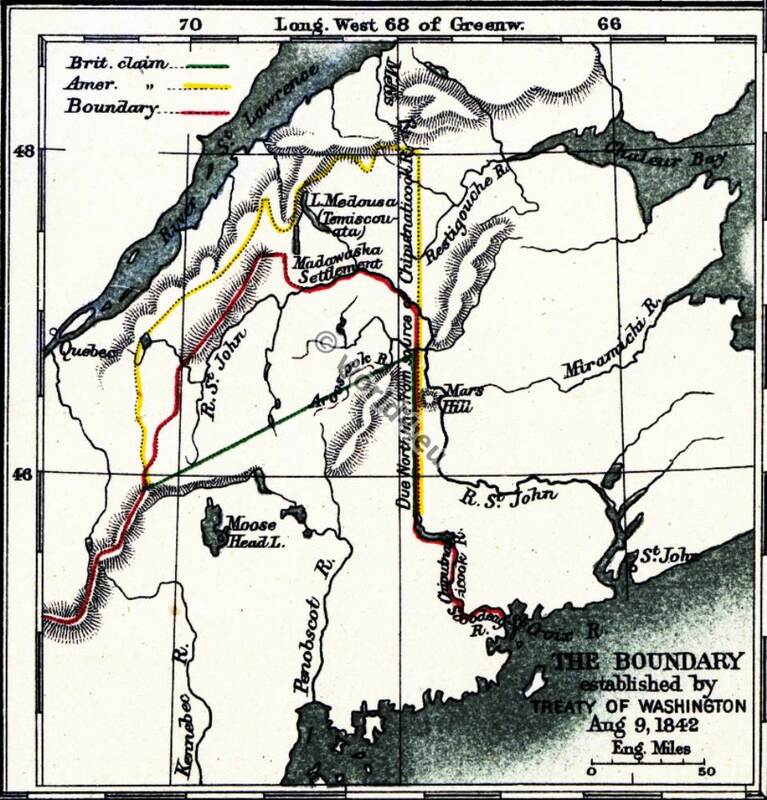 The Treaty runs, ‘East by a line to be drawn along the middle of the river St. Croix, from its mouth in the Bay of Fundy to its source, and from its source directly north to the aforesaid Highlands, which divide the rivers that fall into the Atlantic Ocean from those that fall into the river St. Lawrence.’ The northern boundary had been defined, ‘From the north-west angle of Nova Scotia, viz. that angle which is formed by a line drawn due north from the source of the St. Croix River to the Highlands; along the said Highlands which divide those rivers that empty themselves into the river St. Lawrence from those which fall into the Atlantic Ocean, to the north-westernmost head of Connecticut River; then down the middle of that river to the 45th degree of north latitude; from thence by a line due west on said latitude until it strikes the river Iroquois or Cataraquy; then along the middle of said river into Lake Ontario, through the middle of said lake until it strikes the communication by water between that lake and Lake Erie; thence along the middle of the said communication into Lake Erie, through the middle of said lake, until it arrives at the water communication between that lake and Lake Huron; thence through the middle of said lake to the water communication between that lake and Lake Superior; thence through Lake Superior northward of the Isles Royal and Philipeaux to the Long Lake; thence through the middle of said Long Lake and the water communication between it and the Lake of the Woods to the said Lake of the Woods; thence through the said lake to the most north-westernmost point thereof, and from thence on a due west course to the Mississippi.’ The Treaty repeated the provisions of the articles of agreement which had been signed by the Commissioners on November 30, 1782, France having consented to such negotiations, so long as their formal ratification was postponed until the signing of peace between Great Britain and herself. In conducting the negotiations, Oswald, the British Commissioners, was assisted by Strachey, who arrived in Paris at the end of October, 1782. The British representatives desired that the Kennebee River should be the boundary between Nova Scotia and Massachusetts, thus repeating a claim which Great Britain had strenuously resisted when made by France on behalf of Acadie. 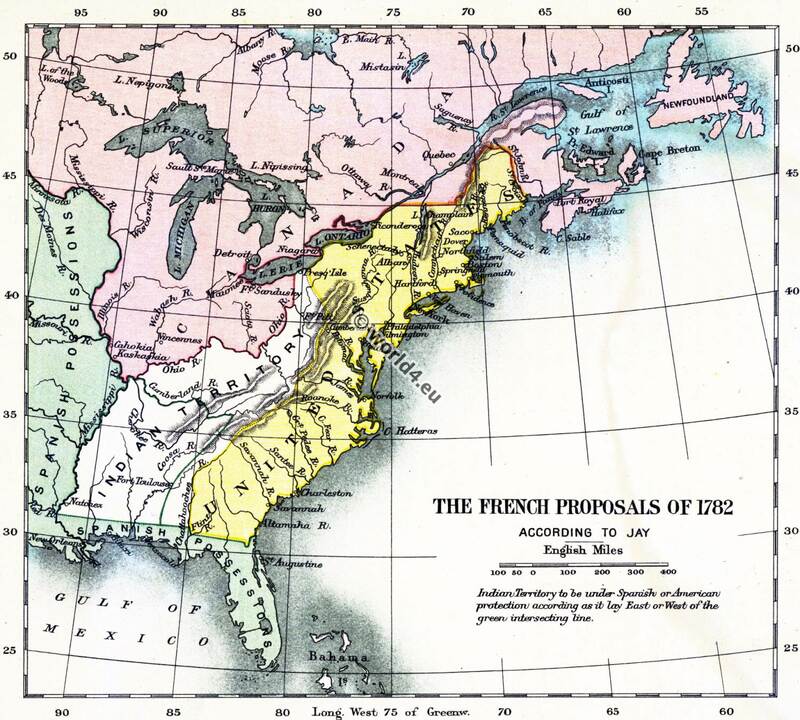 The French Proposals of 1782. According to Jay. Indian Territory to be under Spanish or American protection according as it lay East or West of the green intersecting line. The final terms were, however, more favorable to England than had been the preliminary agreement signed by Oswald on October 8, 1782. Oswald, who had begun by receiving with favor Franklin’s suggestion that the best means of making peace permanent was to hand over to the United States Canada and Nova Scotia-a course to which Rockingham and Shelburne were reported to seem ‘not very averse’- had finally agreed to the following boundary: ‘East by a line to be drawn along the middle of St. John River from its mouth in the Bay of Fundy, … north by a line to be drawn from the north-west angle of Nova Scotia along the highlands which divide those rivers which empty themselves into the river St. Lawrence from those which fall into the Atlantic Ocean to the northernmost head of Connecticut River; thence down along the middle of that river to the 45th degree of north latitude, and thence due west in the latitude 45 degrees north from the Equator to the north-westermnost side of the river St. Lawrence; thence straight to the south end of the Lake Nipissing, and thence straight to the source of the river Mississippi.’ The difference in the frontier as settled by the first and the second agreement is brought out in the lower map on the left hand of the Plate. A proposed addition to the agreement was made by Franklin, who wisely suggested that on the east the true line between Nova Scotia and the United States should be settled by Commissioners on the spot. This agreement was not approved by the British Government. 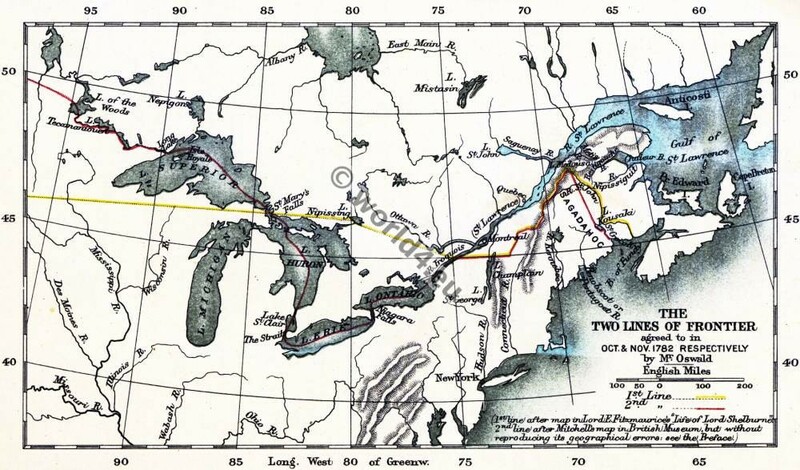 The intention apparently was that the frontier should follow the St. John river and the branch which is now known as the Madawaska, but which was then incorrectly considered the main stream. The Highlands would then be the hills at the head of this river near Lake Medousa. The elaborate detail with which the boundaries in the final agreement were set out arose from the intention ‘that all disputes which might arise in future on the subject of the boundaries of the said United States may be prevented,’ but the result was to emphasize the danger of using geographical expressions without an exact knowledge of geography. The Commissioners were assisted by ‘Mr. Roberts, a clerk in some of the Public Offices, with books, maps, and papers relative to the boundaries.’ Unfortunately, however, the map used, Mitchell’s, was afterwards shown to be incorrect. The geographical notions in England of the river St. Lawrence from its mouth upwards were in 1755 exclusively derived from French maps, whilst those of the Atlantic shores were chiefly derived from British observations. And so it happened that, although the errors were on the same side, the difference was greater by nearly one degree of longitude on the river St. Lawrence than on the Atlantic shores. Hence it followed that’ the position of the several short rivers that fall into the river St. Lawrence from the south, and of the places determined by reference to those rivers, was placed on the maps from forty to fifty miles east of their real position relatively to the various places along the Atlantic shores*. For this reason the source of the St. John or Madawaska (then considered the main stream), which was considered as the north-west angle of Nova Scotia, is placed on Mitchell’s map only five miles west of the termination of the line drawn due north, whereas in fact it lay about forty-five miles to the west. Moreover, although the fact was unattended with practical results, the Mississippi of course does not rise at a point due west of the Lake of the Woods, neither was there such a lake as the Long Lake marked by Mitchell. It was on the meaning of the terms used with regard to the eastern and north-eastern boundary that controversy arose. Even with regard to the identity of the St. Croix river, although it had been often mentioned in old grants, there was a difference of opinion which was not settled until Commissioners had been appointed under the Treaty of 1794, when a monument was erected at the site which was agreed to be the source of that river. The great crux of the boundary question was, however, the meaning to be attached to the words relating to ‘the north-west angle’ of Nova Scotia. There is not room here to embark upon the long and confused controversy, which was not settled till the signing of the Ashburton Treaty in 1842, but the general conclusion would seem to be, in the words of Jefferson in 1803, that ‘the boundaries … were too imperfectly described to be susceptible of execution.’ The justice of this statement was shown at a later date, when the Commissioners, who were appointed under the Treaty of Ghent, 1814, were found to differ hopelessly, and again in 1831, when the King of the Belgians, to whom had been referred the decision of the question, was unable to agree to either the American or the British contention, and proposed a new boundary of his own, thereby, as the Americans contended, exceeding the terms of his authority as arbitrator. The Boundary established by Treaty of Washington Aug 9, 1842. * A. Gallatin, The North-East Boundary Question. Source: Historical atlas of modern Europe from the decline of the Roman empire: comprising also maps of parts of Asia and of the New world connected with European. Author: Poole, Reginald Lane. Edited by Reginald Lane Poole. Publisher: Oxford: Clarendon Press; London; New York: H. Frowde.